We're just finishing up with a flurry of Gift Shows. The past few weeks we've done the shows in Los Angeles and Las Vegas and today we're finishing up with New York. New York has been the most exciting and most productive of all - not to mention New York is a great town to visit. The weather hasn't been our best friend here, but we've still had fun. In the next few months there are going to be some great new products in the store. Julia Knight has introduced a lot of new colors in her floral collections. She's also designed a stunning seahorse base serving platter. We're bringing in a new collection of lighting from Vietri. These are beautiful rustic Italian designs that match back to their garden pottery collection. 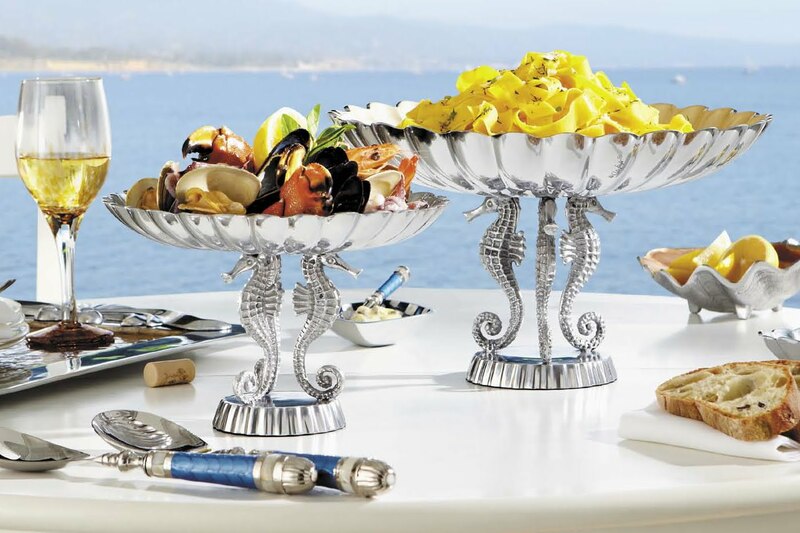 We're also featuring a beautiful new ocean inspired collection of serving pieces from Vietri. We can't leave New York without at least some mention of food. As usual, we've had some really good meals. When we arrived we headed for a late dinner at Union Square Cafe. This has always been a favorite of ours and this time it didn't disappoint. The food, drinks, service, and ambiance are always superb. Whenever we walk through the door, whether it's been 2 days or 2 years, we're treated like an old friend. One other highlight was a place we happened in to by chance. We had tried to get into a celebrity chef Italian restaurant but it turned out to be a mob scene. Instead we decided to try a little place right across the street, North Square. This is a charming spot in the Village featuring new American cuisine. Chef Yoel Cruz has created an amazingly diverse menu, all well prepared, and extremely reasonably priced - especially for New York. One last restaurant of note was lunch right before departure today at Il Punto. Il Punto is an Italian trattoria specializing in food from Puglia. Another happy accident, the restaurant is in an out-of-the-way spot not far from our hotel. Again, great food and great service - a perfect end to New York and the perfect start to our trip to that region. Coming in the next few days we'll be posting regularly from Italy. Ciao.